The University of Alabama’s not-so-secret political coalition The Machine, which controls their Student Government via approved members of the Greek system, has dissent in its midst. On Monday, the student paper The Crimson White published an op-ed from a senator who says she no longer wants to work under their influence, as well as a story featuring three anonymous members of SGA about what it’s like to work with The Machine breathing down your neck. In brief, the Machine is a group of students who are all members of historically white Greek sororities and fraternities, whose job it is as representatives is to work to influence members of the SGA to vote in ways that will be advantageous to Greek life at the University. Once approved candidates are voted into office, Machine members communicate with them on who they’d like to get elected and how to vote on specific matters. Smith also further emphasizes the how difficult it has been for current SGA President Elliot Spillers to work effectively during his tenure due to the Machine (Spillers is the first black SGA President at UA since 1976 and the first non-Machine appointed leader in decades). It was painstakingly clear the only reason the senate would not approve the appointment of President Spillers’ chief of staff was because he wasn’t who The Machine picked. We were told that he “wouldn’t be good for the greek system.” I remember having conversations with other Machine senators who believed blocking the appointment was unfair and that President Spillers had every right to choose who he thought would be most qualified for the position. To be honest, we were all a little afraid of what would happen if we didn’t vote how we were supposed to. Would we be in trouble? Would our fraternity or sorority suffer? What would this do to our future SGA careers? Interestingly, both pieces explain that once elected, the Machine doesn’t seem particularly interested in the platforms of the particular candidates they elect, just that they do what they’re told. Jamie attributes the lack of Machine interference to a general need for power as opposed to support for any particular candidate’s platform. This is hardly the first time individuals have spoken out against the Machine, though it does seem to occur in fits and spurts; a 2004 Crimson White article outlined the struggles of Emily Aviki, a Chi Omega SGA Senator who was verbally threatened when she didn’t vote the way Machine representatives told her to. But the pieces are timely, given the tensions that seem to be rising to the surface at Alabama over the past few years. A few weeks ago, screenshots of texts showed sisters in the Alpha Gamma Delta sorority being told not to vote for their sister Halle Lindsay for Homecoming Queen because she wasn’t a Machine-backed candidate, and to instead vote for Katelyn Katsafanas. The Alpha Gamma Delta sisters were concerned about losing the support of the Machine if word got out that they weren’t supporting Katsafanas, which, in their mind, could have ruined them socially. And it worked, it seems: while Lindsay made it to Homecoming court, Katsafanas ultimately won Queen. If it wasn’t clear before, much of the Machine’s power seems rooted in student fear of unknown rather than anything else. 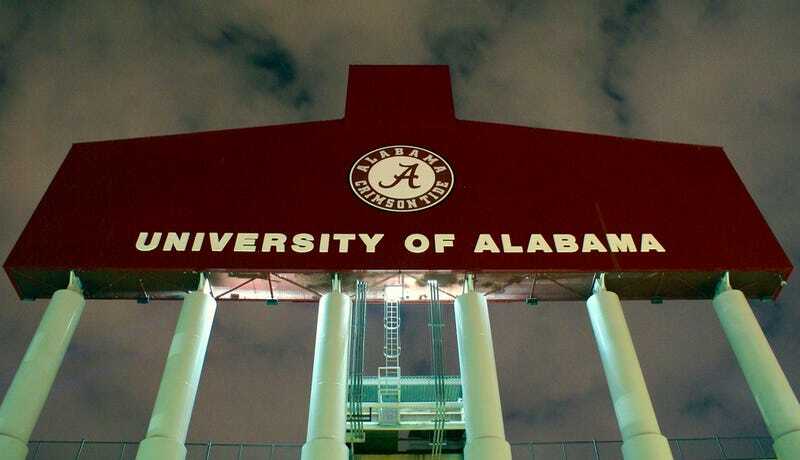 But it does have real world, non-University of Alabama ramifications: two years ago, the Machine successfully got a former student/SGA president and another UA alum elected to the Tuscaloosa school board, reportedly through tactics some considered voter fraud.